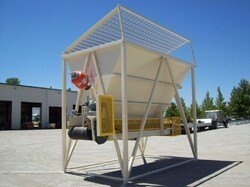 We are a leading Manufacturer of grizzly hopper from Delhi, India. We are highly appreciated in the market for our wide assortment of Grizzly Hopper. It is a unit designed for full-pallet applications. Our range is used for shipping lane accumulation or for a manual pallet-loading operation. To rule out every possibility of defect, we inspect these hoppers on certain parameters of quality. Looking for Grizzly Hopper ?